The first part of Dreamscarred press's AP set in the all-psionic world of Ksaren is 55 pages long, 1 page front cover, 1 page editorial, 1 page SRD and 1 page back cover, leaving a whopping 51 pages of content, so let's sharpen our mind's eye and check this one out! This being an adventure review, I urge potential players to jump to the conclusion due to rampant SPOILERS. Still here? Righty right! When the second-most powerful seer in Arbil collapses dead after a cryptic prophecy about the unraveling of future, the PCs are charged to prevent the destruction of futures as prophesized by the now-dead psionic. Thus, the pdfs are set off on a sandboxy journey through the city of Arbil and the surrounding area - after all, trade with the nearby kobold mines have all but ceased and the recent earthquake does not bode well. In Arbil and the surrounding lands, a plethora of sidequests of the fetch(kill-variety abound and make one reminiscent of e.g. Baldur's Gate 1. It should be noted, though, that the xp-rewards for these quests and throughout the whole adventure are rather massive for my tastes. EDIT: Dreamscarred Press have gone above and beyond in revising this adventure and provided A LOT of new maps, making now each area of the adventure mapped. While the main story still feels like one among many different small and medium quests, the new maps as well as the revised fluff-boxes do a lot to do evoke a sense of immersion in a campaign world that feels distinct and different as well as organic - kudos! In the Kobold City, a minor murder mystery is set, that as presented is nothing but a series of skill-checks. While the new map makes the city easy to picture, I think the overall presentation as a series of skill-checks is somewhat detrimental to the mystery's appeal - a pity in the face of the rather neat little mystery, for the main antagonists of this adventure are puppeteers, slug-like mind-controlling parasites that make each and every defeated foe count double - saving as many as possible will have major influence on the adventures to come. The adventure also features two dungeons, the old and the new mines, both fully mapped and especially the new mines coming with some beautiful pieces of artwork and the option to crash through the mine in a cart - very cool! EDIT: The formatting problem with the maps has been taken care of. The final fight against a puppeteer hive brain is cool and sees the Pcs destroy a machine creating the psionics-weakening disturbance in the flow and, depending on the PC's performance, an exodus of the kobold populace to their city - very cool, as it features real consequences of the PC's deeds throughout the adventure. Also included is information on the city of Arbil, a 4-page extensive write-up of Kobolds as a playable race and an article on Duels in the Ophidian Protectorate. It is here that the 3.5-legacy indebted to Malhavoc Press's Hyperconscious becomes readily apparent - once, the duel was a form of subcombat via Mindscapes, which was cumbersome, slowed the game to a grinding halt and was a prime example of mechanics that just don't work well. In PFRPG, these duels as a means of advancement have been streamlined and in the second iteration of this adventure, expanded: While the basic concept is still not absolutely awesome, the revised iteration of the rules adds some tactical depth to the opposing rolls of the combatants. On a more positive note, we get a random monster table and compiled stats (including artworks) of the beasts herein: Brain Moles, Crysmals, Deep Hounds (regular and dire), Folugubs, Maenads and 3 kinds of puppeteer as well as temporal filchers, thought eaters and advanced wolverines makes their appearance. The pdf concludes with an overview of the adventures to come in the arc and seem to span a wide array of different themes, which is nice. The points of criticism I had for the boxed texts have been thankfully taken care of, but this adventure still feels like a 64 or 72-page adventure that has been cut down to accommodate gazetteer-like sections, which, while not bad, would have been put to better use with more details. Ksaren is an intriguing world and the AP feels completely different from all the commercial adventures for PFRPG I've read so far, which on the other hand is a plus - it takes quite an effort to do that to jaded yours truly. In the end, though, the sketchy nature that at times make this adventure feel less detailed than it could or should have been. While the section on psychic duels has been improved, I'm still not sold on the overall idea. Dreamscarred Press have done a MASSIVE amount of fixing with the second iteration of their first adventure and it shows - from text to maps to rules, each and every aspect of the adventure has been improved. Seeing that the team has managed to improve even the terrible basic idea of psychic duel that has plagued psionics for several editions to a point where I can consider the rules ok - not splendid, but usable. The sandboxy adventure featuring varied quests, wilderness, crawling etc. feels unique and in the end, the improvements pay off. 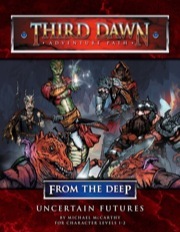 While the overall structure of the adventure still feels a bit cramped and the mystery a bit rudimentary, I still think that none of the other adventures released for PFRPG feel just like this, making the overall experience distinct and unique. Thus, my final verdict for the revised edition will be a solid 4 stars for a good start to the AP. And our first adventure - ever - is now available! We're hard at work getting Adventure #2 - Ruling Three - ready to go! Thanks Jeremy! I have the PDF and am enjoying reading it. Looking forward to getting the whole series! Oh, I just remembered: There are also some instances where brackets point towards the Campaign Setting - when you release the campaign setting, you should make sure the pages are still the correct ones. Map of the nearby area. Michael (the author) is working on that, after which Rick (the cartographer) will hopefully be able to make it look pretty. Map labels - going to fix that in the text, rather than the graphics, so the M's match the M's. Duels - going to reevaluate the implementation of this. This was not intended as a true form of psionic combat, but as a means of gauging relative psionic power. That being said, if the implementation is the biggest issue, we might be able to figure out a better way to do it. Box Text - going to reevaluate and see what needs to be expanded. If you had any particular sections you noticed were lacking, I can make sure to focus on those. Excellent news regarding the maps, btw.! Yeah, I'm having the text in pages 10 (Forest), 18 (Temple), and 21 (Old Mines) split up. Upon reviewing, I saw what you mentioned - GM knowledge got put into Player descriptions. That knowledge will be maintained for the GM, but removed from the description. The blue box on page 27 is having the "under the control" removed. Those were the ones that I noticed. I'll do another review to make sure I didn't miss any. Psionics for PFRPG? What do you need to run this AP? Psionics Unleashed and the Free Players Guide. If you're into Psionics, check out the advanced Psionics Guide as well - the DSP guys know their craft. Hmmmm...how far have they deviated from the 3.5 psionics system? Psionics unleashed is the update and streamlined, improved version of 3.5. If you liked 3.5's XPH, you'll like PU. There are 11 reviews of the book on site and I've been using the book myself. Soulknives and Psychic warriors and Wilders finally work for example... No WoTC-IP, though. Currently, all the edits to the adventure itself are in (3 new maps - Vensnak, Hirauu Forest, and a "path" that's a zoom-in of the surrounding country), as well as some of the typo changes / removal of GM information from player blurbs, etc. We're still working on the changes to the duels to make them more "interesting" while keeping them consistent to the intent of the region. These aren't intended to be a catch-all set of psionic combat rules, but are intended specifically for the Ophid Protectorate, where might makes right. Spending power points to boost the roll - so the question is, will you run out of power before your enemy? Do you have a larger pool to draw from? Forfeiting a roll to manifest a mind-affecting power on your opponent - will the power work? Will it give you the boost needed to win when you've given your opponent a free point? Just thought I'd keep the thread updated. The download has not yet been updated until all changes are finished. All the changes have been sent off and we're just waiting for our layout artist to finish implementing them. Hopefully, this will be done this week and we can get it to the printers! And the revised copy is now available! I'm actually working on the 2nd adventure - we've already sent off for the maps and artwork, and I'm working on the editing of the manuscript, as well as the supplemental material - so the feedback in here is definitely being used as a benchmark for the next in the series. In particular, the feeling of being cramped - we didn't cut anything or reduce page count - a 55 page book and a 100 page book cost the same from a printing perspective (artwork, maybe not so much...), so I'll keep an eye out for where things might feel "undeveloped." I'm glad you liked my adventure so much! Here's hoping you like the rest of the AP as well. I like this adventure, but I have a question: Where is the Ophid Guard prestige class that Captain of the Guard Sudas has? It can actually be found in the Third Dawn Campaign Setting. I didn't notice that it was included in Sudas's stat block... Probably need to get it updated to Pathfinder. Could you clarify what effect has manifesting a power in a psionic duel and provide an example, please? It says that the power affects the target as normal, but does not state what that entails in a duel. If the one Manifests Thought Shield - he gains Power Resistance 13 against mind-affecting powers. If the enemy then uses Ego Whip, it has to bypass the Power Resistance, but if it succeeds, the target then takes Charisma damage and possibly be dazed. Each duel check would be considered one round for the purposes of effect duration. So, if Ego Whip succeeds and the target is dazed, he can't make duel checks? Correct - a dazed creature can take no actions. Has anyone run these adventures with a group yet? How did it go? Is this an AP that uses Psionics? Hi Kydeem - I'm currently running my gaming group through #1. We're currently halfway through it and the only issue I've run into with it is being sure to read it in advance. I tried to go with little advanced knowledge of it and got caught a couple of times. Hayato - yes. 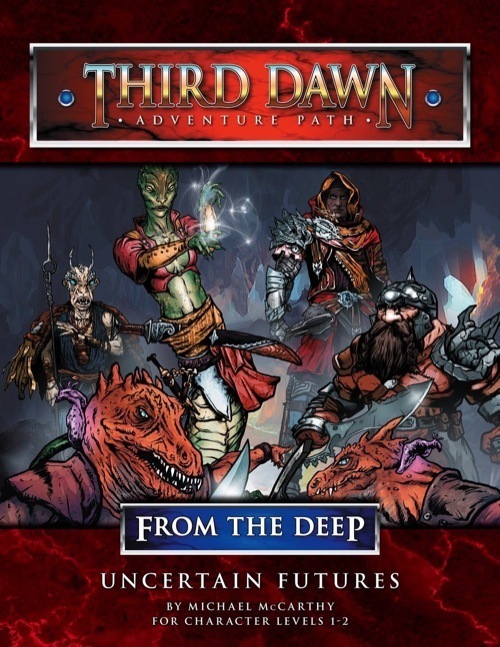 It is set in the all-psionic Third Dawn campaign setting and the NPCs and monsters are almost all psionic in nature (there are mundane creatures as well as psionic creatures in it).